The Great Lakes, located on the Canada-United States border [Figure 1], are an important resource to the culture and economy of their surrounding area, providing drinking water, recreational activities, and tourism. They are also home to a wide range of wildlife, including migratory and resident birds (Ontario Biodiversity Council, 2015). Twenty percent of the world’s fresh water is contained in the Great Lakes, making them an important source to maintain (Roelofs, 2015). Since the 1960’s, the lakes have been experiencing increased growth of cyanobacteria, commonly known as blue-green algae (Ministry of Ontario, 2014). This is a naturally occurring plant-like organism, found in shallow, warm, slow moving waters that contain the toxin microystin (Ministry of Ontario, 2014). In fresh water environments, phosphorous and nitrogen are limiting nutrients, in that they either limit or excel an organism’s growth. An excess of these nutrients in fresh water, known as nutrient loading, leads to an uncontrolled growth of cyanobacteria, called an algal bloom (Environment Canada, 2013). Lake Erie is particularly vulnerable to algal growth, revealed in Figure 2, as it is the shallowest of the five Great Lakes (Office of Auditor General of Canada, 2007). Nutrient loading is caused by fertilizers (synthetic and organic) used in agricultural practices, urbanization and human waste, and household products containing phosphorous compounds, such as detergents (Roelofs, 2015). The excess dissolved phosphorous and nitrogen can enter nearby water systems by run off or leaching (Chung, 2014). This increases the growth of cyanobacteria as it feeds on dissolved nitrate and phosphate, producing murky green waters known as algal blooms (Roelofs, 2015). Algal blooms have caused problems in the Midwest United States and Southern Ontario, impacting human health and altering ecosystems (Roelofs, 2015). Human health is threatened if contaminated water is consumed as it can trigger gastrointestinal discomfort and liver damage (Roelofs, 2015). In addition, algal blooms may prevent engagement in recreational activities such as boating, swimming and fishing, due to toxicity; this is also economically damaging. Cyanobacteria blocks light for photosynthesis from reaching the bottom of the lake, affecting aquatic vegetation, and in turn, aquatic species that rely on the vegetation for food and nurseries (Anderson, 2005). As algae decays, it consumes oxygen and releases carbon dioxide (NOAA, 2012), causing “widespread mortalities of plants and animals” (Anderson, 2005). Dead zones are created in the water, which are areas of hypoxic conditions (National Geographic Society, 2011) in which very few organisms can survive. In addition, invasive species, such as zebra and quagga mussels, that have entered the ecosystem by human activities, are perpetuating the issue by consuming edible algae, allowing the toxic algae to survive with less competition (Roelefs, 2015). Furthermore, heavy rains and warmer temperatures due to climate change are altering ecosystems and increasing runoff. The ensued changes in salinity and carbon dioxide levels promote growth of algae (SOBR, 2015). Any solution to algal growth requires a complete effort from various sectors including urban, suburban and agriculture (Roelefs, 2015). Cooperation between all stakeholders and decision makers are vital to conserving the health of the Great Lakes. A wicked problem is characterized by a high degree of scientific uncertainty and social conflicts that include discrepancies regarding its values. The difficulty in solving a wicked problem stems from reasons such as poor knowledge, conflict between stakeholders involved, and its persistence (Balint, P.J et al., 2011). Figure3. 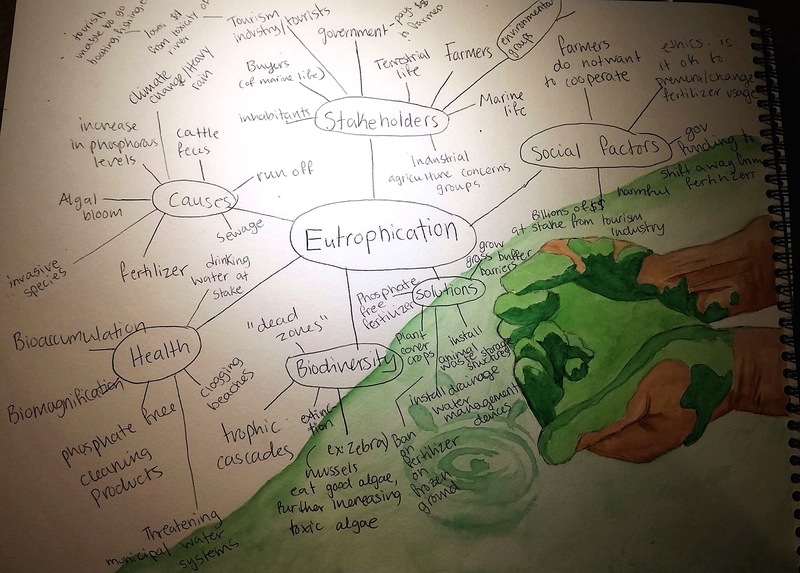 Mind map featuring key issues, causes and stakeholders involved with eutrophication of the Great Lakes. Artwork by Sima Nuri. Figure3. Mind map featuring key issues, causes and stakeholders involved with eutrophication of the Great Lakes. Artwork by Sima Nuri. One of the most pressing issues is that as the Great Lakes ecosystems constantly change, nutrient management must constantly adapt (Environment Canada, 2013). Scientific uncertainty in relation to climate change, a more wicked problem, perpetuates the issue by providing a more habitable atmosphere for harmful algae (Thornton, J.A et al, 2013). In addition, invasive species that are affecting biodiversity and ecosystem health by creating dead zones, are altering the lake ecosystem, furthering scientific uncertainty. With little knowledge on the future health and composition of the lake ecosystem, restoring the lakes proves to be a daunting task. Secondly, biological, social, and political aspects must all be taken into account to “provide the best opportunity for creating plans that meet human and natural system needs and a balanced approach to lake stewardship” (Thornton, J., et.al., 2013). The interdisciplinary approach and necessary steps required is challenging due to the differing values and little consensus between decision-makers and stakeholders. Environmentalists, for example, may believe that maintaining biodiversity through lake health should be prioritized, but farmers are more concerned with producing an adequate yield possible only through the use of fertilizers and specific farming practices (Chung, 2014). Despite government attempts to deviate farmers away from fertilizers containing high levels of nitrogen and phosphorous, farmers continue to use the products as their personal benefits outweigh the negatives, especially since farming is more intensive now than it was in the past (Ansari A. Abid, 2011). Moreover, an economist would prioritize losses in tourism as a result of the river’s toxicity and unpleasant sight. While the public may not want to reduce their detergent usage, prioritizing cleanliness. The various conflicting views clearly make it difficult for decision makers to come a proper consensus. To solve this wicked problem, site-specific methods and adaptive management are necessary (Thornton, J., et.al. 2013). Eutrophication has been a wicked problem due to its continued presence despite the numerous efforts taken to attempt to eradicate the issue. This proves that there is no ultimate right or wrong solution to the issue, but only a better or worse one, reiterating the matter as a wicked problem. A wicked problem of this magnitude often sparks much discussion regarding the management of the resource at hand. Discussions of this nature involve the organization of the governing bodies themselves, legal action (if necessary), and the establishment of enforcement tactics. 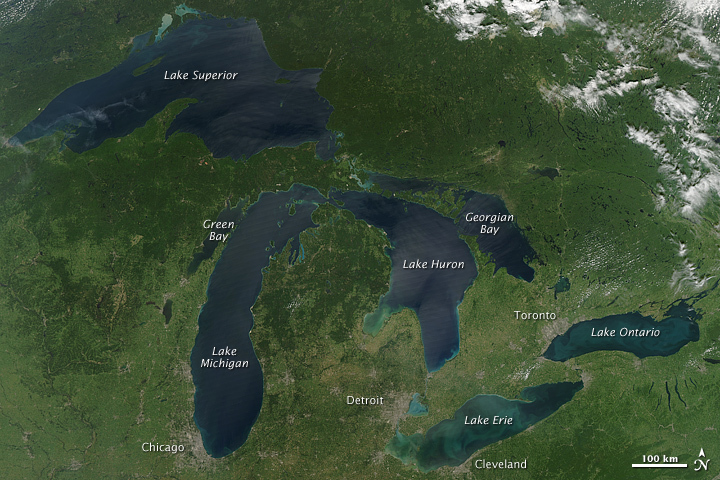 In the case study of water quality in the Great Lakes, there is no exception. Moreover, the role of governance regarding this wicked problem is amplified versus other wicked problems due to its binational nature. The fact that the Great Lakes region lies, by and large, right in the middle of the U.S. – Canada border complicates governance issues. Many of the decisions, acts, legal contracts, and policy reforms must conform to binational agreements as well. Despite these challenges, the environmental branches of the Canadian and U.S. governments (along with some state/provincial powers) have been effective in generating agreements that (in theory) should tackle the issue with a high level of efficiency. Despite the governing bodies’ best efforts to satisfy all stakeholders, there is often a great deal of conflict regarding policy reform. One of the primary resistors of policy reform is the farming community around the Great Lakes, as many policy changes alter the effectiveness of farming and their subsequent yields (Forster, 2000). From a Canadian perspective, the most prevalent of governing bodies for this issue is Environment Canada. Environment Canada has taken charge in combating the contamination of water in the Great Lakes, by identifying the main causes of eutrophication and contamination, the consequences of said contamination, and the actions that should be considered to mitigate the problem’s wickedness. Along with Environment Canada, the Provincial Government of Ontario has sought to combat the issue at a more local level. This is done through the establishment of Source Protection Committees in conjunction with the Clean Water Act of 2006 (Hania, 2013). From a binational perspective, the most significant contract/agreement set in place is the Great Lakes Water Quality Agreement (GLWQA). This is an agreement that was forged by the Federal Governments of the United States and Canada in 1972, and signed by Prime Minister Trudeau and President Nixon (Krantzberg, 2007). Despite not undergoing any revision until 2012, the GLWQA is the flagship agreement in combating this wicked problem. The GLWQA is a broad spectrum initiative that attempts to identify all of the threats to water quality in the Great Lakes. Moreover, the GLWQA breaks down each threat type and outlines the action that should be taken to rectify the issue. For example, the agreement defines 7 different threats to water quality, and each one has a subset of subsequent action (i.e. Chemical Contaminants) (Environment Canada, 2015). The contaminants that are most highly scrutinized are phosphoric and nitrogen based fertilizers that run off of farms and into the lakes during times of heavy rainfall. It is this runoff that leads to hyper-eutrophication, and the resulting contamination of fresh water basins. The province of Ontario has established a system in attempt to combat hyper-eutrophication at a more local level. The system entails 19 different Source Protection Committees that are each responsible for a small sector of land bounded in Canadian resource control. In conjunction with these committees, the Clean Water Act of 2006 in Ontario founded a program that combats issues that the GLWQA does not (Conservation Ontario). This program is known as the Ontario Drinking Water Stewardship Program. The program was initialized to provide financial assistance through the Ministry of the Environment, to local businesses and farmers implement costlier conservation techniques (Conservation Ontario). From an American perspective, the most prevalent entity in combating hyper-eutrophication and water quality is the Great Lakes Commission. It should be noted that this commission is also binational, as it includes the provinces of Quebec and Ontario along with 6 different U.S. States. The Great Lakes Commission is very similar to the GLWQA, as its primary concern is research and conservational policy development (Great Lakes Commission, 2015). On top of these primary agreements and commissions, there are many other smaller state and local initiatives that seek to accomplish the same goals. With such a plethora of governing entities regarding this issue, there is cause for some overlap and even conflict. However, the fact that there are so many different agreements and commissions (often by the same entities), is a result of the wickedness of the issue, not a result of disorganization. Moreover, this notion may in fact be the best definition of a wicked problem that we can forge. In other words, the need for a high volume of binational, state, and local organizations to combat a single issue is well and truly a definition of a wicked problem. The eutrophication of the Great Lakes can only be solved through close cooperation between the local, provincial, and federal actors. Simply enforcing legislative restriction to the local farmers will not resolve the friction in conflicting values within the stakeholders. Federal and provincial governance systems are responsible in instituting large-scale frameworks that become a guide for what locally organized institutions ought to carry out in solving this problem. Simultaneously, a faithful relationship must be constructed between the local community and government agencies where the policies are initiated, to avert misunderstandings and protests. Our action plan is composed of three sections: federal/provincial ordinance, broad local engagement, and continuous inventive efforts for further effective solutions. The main actors for the first component are the federal and provincial governments of both Canada and United States. 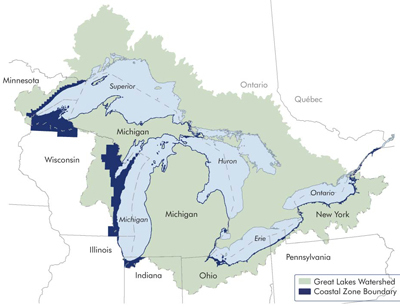 The proposals made by the binational Great Lakes Water Quality Agreement established by Canada and U.S. proposes to establish target values of phosphorus levels by February 2016, and further aims to construct a domestic action plan by February 2018 (Great Lakes Water Quality Agreement Nutrient Annex Subcommittee, 2015). Through their Lake Erie-wide action and management plan, the committee addresses conservation plans and mentions funding local projects through other branches of federal organizations such as the Great Lakes Restoration Initiative in the US (Lake Erie LAMP, 2013). Carefully identifying a target goal that is both realistic and effective is a critical role that the decision makers in the governmental organizations must fulfill. Consultation with expert committees and collaboration with local research universities would be a necessary step in reaching goals, as well as with stakeholders that will be directly influenced by the policies – notably, the farmers that, in all likelihood will be required to regulate their use of fertilizers. The high level of relevance of the expected policies to the local community indicates that there must be efforts to engage the local stakeholders and population is requisite for a smooth integration of the policy. The second component, advocating and conducting engagement opportunities for citizens is perhaps the most challenging aspect of this action plan. So far, the GLWQA has been successful in holding webinars to explain their policy goals mainly targeting stakeholders that is part of the agricultural committee (United States Environmental Protection Agency, & Environment Canada, 2009). Future insight for broader engagement can also be observed in the proposal of Canada-Ontario Agreement on Great Lakes Water Quality and Ecosystem Health, emphasizing their intention in initiating engaging activities and seminars for the local community and First Nation groups (Government of Canada & Province of Ontario, 2014). Providing numerous opportunities may require time and funding, but arranging such occasions are inevitable in a successful trusting relationship between the individuals directly affected, economically and socially, by the policies, and the policymakers. Connections with environmental associations and/or agricultural associations such as the Canadian Federation of Agriculture would be helpful in raising publicity of the outcomes of the policies and organizing public information events. Lastly, there should be a continuous effort in exploring innovative methods to minimize the potential economic dysfunctional results from the phosphorus regulation. This portion of the plan will be oriented by research-based organizations such as Fertilizer Canada, striving to provide environmentally sustainable and highly productive resource management strategies. In answer to concerns regarding the harmful effects of phosphorus-loaded fertilizers, Fertilizer Canada has endeavored to promote their 4R Nutrient Stewardship strategy, aiming to heighten the sustainable use of fertilizers around Canada (Whyte, 2015). Studies have shown that incorporating dynamic agricultural tactics such as transitional use of tilling/no tilling or crop rotation in farming leads to reduction of harmful environmental effects. Raising media interest of such scientific innovations and contemporary agricultural devices will lead to widespread use of these environmentally friendly tactics. If revenue is successfully produced through the practices, the federal and provincial government will be able to fund research that further leads to more efficient technology and farming models. Modification of governmental funding objectives and generation of new funding plans are often controversial, but successful engagement in the previous step of the action plan could contribute to convincing the public of funding such projects instead of others. Fundamentally, the three components in this action plan are irreplaceable, due to their reliance on the success of each procedure. The intertwined strategies will be effective in tackling this complexly inter-tangled issue, addressing the problem from multiple dimensions. Forster, L. (2000). Public Policies and Private Decisions: Their Impacts on Lake Erie Water Quality and Farm Economy. Journal of Soil and Water Conservation, 55(3), 309-322. Hania, P. (2013). Uncharted Waters: Applying the Lens of New Governance Theory to the Practice of Water Source Protection in Ontario. Journal of Environmental Law and Practice, 24(2).Print. Krantzberg, G. (2007). The Ongoing Review of the Great Lakes Water Quality Agreement. International Association for Great Lakes Research, 33(3), 699-703.Print. Ansari A. Abid, Gill Sarvajeet Singh, Lanza R. Guy and Rast Walter. Eutrophication: Causes, Consequences and Control. London, NY, 2011. Print. Wines, Michael. (2013, March 14). Spring rain, then foul algae in ailing Lake Erie. The New York Times. Retrieved from: http://www.nytimes.com/2013/03/15/science/earth/algae-blooms-threaten-lake-erie.html.